We can manufacture our custom plastic part in highly accurate by this method. For some critical dimensions in thermoplastic part, we can reach +0.05 / -0.05 mm depends on the part size. The production process is flexible with the option to match your needs in quantities or colors. You can easily switch the part color after certain quantities molding, or you can have your parts in several colors in small quantities. For some components, they needed to be worked under pressure. High strength is very important! By using the injection molding process, we can select the high strength material to mold the part. This is easy to reach the requirements not only for material selection but also for the manufacture stability. 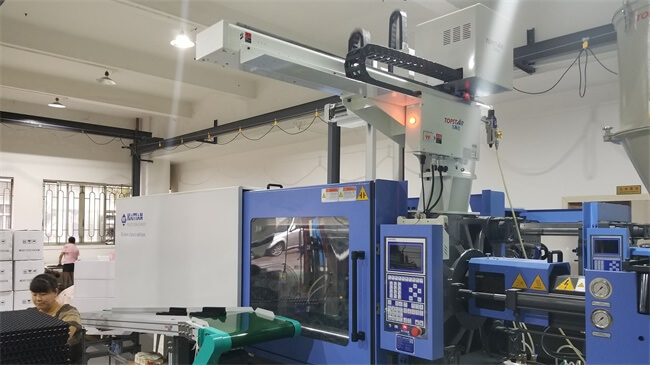 Plastic injection molding allows you to make your parts in high efficiency, especially for the high volume production. Most parts are easily completed within a time-frame of 15 t0 30 seconds. Series of finishes are available for your selection. Glossy, texture, smooth, etc can be applied onto your parts directly without secondary operation. Plastic Injection Molding is a low cost production. It is not only benefit for the large volume production but also benefit for low volume manufacturing nowadays. There is rapid tooling method which is quite suitable for the low volume production, lower cost without compromising the quality. When you have 50, 100 or more plastic parts needed to be made, you can consider the rapid tooling method. TEAM Rapid is a professional mold manufacturing company, we offer low to high volume Injection Molding Service. We fully understand your standard and surely can provide the best solution for cutting down the cost and lead-time. Are you working on a new injection molding project? Contact our team at sales@teamrapidtooling.com today.